Do you need to convert the document of text to pdf file to show the contents in the original file to your friends? If so, you can use the application VeryPDF Text to PDF Converter to make the conversion for free. The application is designed for those who need to convert plain text document to pdf file for non-commercial purposes. You can click here to download the application to your computer and then please double click the installer to follow the setup wizard to install it on your computer. When you double click the application icon, you will see the smart user interface of Text to PDF Converter. At first, please click Menu—Advanced Settings to open Advanced Settings window which is shown in Figure 1. You can set the font name, font size for the created pdf file. 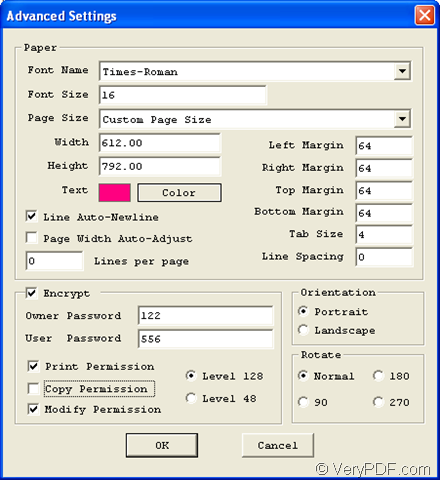 The page size can be set Letter, A3, A4, etc. 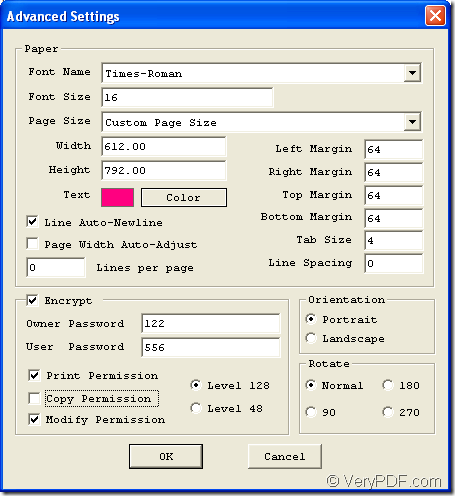 or you can customize the page size for pdf file by inputting width and height value. Also, the text color can be set diversely. If you want to secure your pdf document, you are allowed to set open password and owner password by 40 or 128-bit. At the same time, those unauthorized users can not freely edit your created pdf document as long as you add file permissions like print, copy, modify, etc. For converting text to pdf, please click Open button on the interface or click Menu—Open Text file to open the file picker window for choosing text documents. In addition, this application supports drag and drop operations which enable you to add text files into the program easily. Then the dialog box for saving target file will popup. You can choose the output location, set the file name and then click Save button to run the conversion from text to pdf for free then. Text to PDF Converter also supports batch conversion, you can add multiple text files into the application in batch and then convert them to pdf files. If you need to use Text to PDF Converter for commercial purpose, please purchase a commercial license by entering the homepage of the program. If you have any questions about the conversion or Text to PDF Converter, welcome to contact our support team. This entry was posted in Text to PDF Converter and tagged for free, in batch, text to PDF. Bookmark the permalink.